Your horse can quickly experience discomfort and even pain if his saddle does not fit properly. While most horses can wear a standard-sized saddle, horses with specific conformational issues are often quite tricky when it comes to saddle fitting. The cutback saddle was designed for horses that have unusually high withers, as standard saddles can rub them raw or restrict their movement. Instead of being solid across the pommel, or front of the saddle, the center of the pommel dips back towards the seat to make room for the withers -- the bump at the top of the horse's shoulder between the neck and the back. While virtually all English saddles feature a small dip in the pommel to allow for improved range of movement, a true cutback saddle features a significantly altered pommel design. The cutback is normally 1 1/2 inches to 4 inches long. A streamlined design involves relatively little padding. 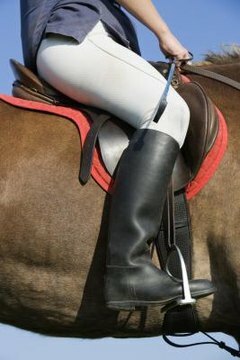 These saddles sit low on the horse's back and are often used without a saddle pad. The design of the saddle is specially tailored so that the entire piece of tack fits closely against the horse's skin. Cutback saddles are widely used within the gaited horse community and are the preferred saddle used in Saddleseat competition. Gaited horses often have higher withers and a more dramatic range of front-end movement that benefits from the freedom allowed by a cutback saddle. Riders who switch from a conventional English saddle to a cutback saddle may want to try riding in several before they purchase one. Seat size varies slightly due to the design of the cutback saddle, and so riders who are used to riding in a smaller size English saddle may want to go up a size or two in a cutback. The size of the seat does not affect how the saddle fits your horse.